Whether you are applying for a green card, to become a United States Citizen, or for some other immigration benefit, you are bound to be nervous for your immigration interview. Most of that fear comes from the unknown. So, arming yourself with knowledge about the process will greatly decrease that anxiety. Here are some tips for dealing with your immigration interview at USCIS (United States Citizenship and Immigration Services). Immigration interviews can last a matter of minutes or can last as long as a few hours depending on the issue and the complexity. For example, a simple naturalization with no issues can typically take as little as 15 minutes. Just enough time for you to ace the civics test, ace the language test and verify the information in the N-400. An adjustment of status interview where you are attempting to become a lawful permanent resident (“green card”) could take as long as several hours if there are some red flags that the adjudicator is concerned about. For example, the adjudicator may suspect a fraudulent marriage based on factors such as a large age difference, different religions, conflicts in the evidence related to living arrangements, etc. The adjudicator could separate each spouse and question them separately to determine whether the marriage is bona fide or fraudulent. You also may wait for a longer period for you interview to begin than you spend in the actual interview. Bring a book. 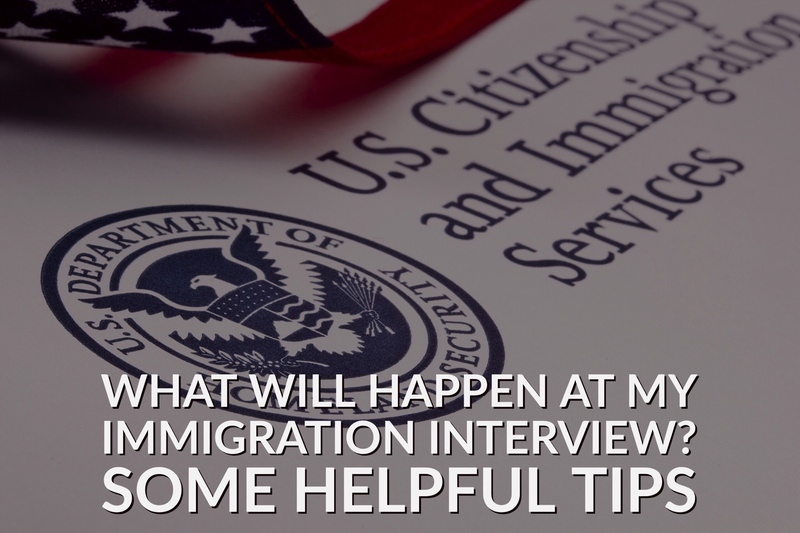 You may be sitting in the USCIS lobby for a long period of time before you are interviewed. Sometimes the adjudicators take you before your interview time, sometimes they can take you hours after your scheduled appointment time. So, make sure you plan accordingly and leave plenty of time to take into account pre-interview waiting. The main concern that we as the attorneys, and the client alike, have during the interview process is what kind of questions the adjudicator is going to ask. Unfortunately, adjudicators have wide latitude in what questions they ask, as long as it is directly related to the issue at hand. So, for example, if you are attempting to get a green card based on your marriage to a United States citizen, the adjudicator can ask very personal and intimate questions to ensure that it is a bona fide marriage, that is, a real marriage. In marriage based interviews, we encourage all of our clients to sit down with their spouse and talk about their history together before the interview. You’d be amazed at how much you’ve forgotten and how quickly it all comes back when you walk down memory road. Prepare for your interview like it is an exam. Look up dates and places that are relevant. It’s not necessary to memorize everything, but the more accurately you can answer the questions, the more smooth the interview will be. The adjudicators are not trying to trick you. They will be able to root out a fraudulent marriage pretty easily. If the marriage is real, it is usually very evident. The main thing you need to remember is that you should do your homework and understand what you are applying for and how your answers affect whether you are eligible or not. You should also never lie or commit fraud during the interview (or any other time). Fraud can be a separate basis for denial of immigration benefits and can lead to deportation. Immigration is a document based system. The entire system runs on documentation. Even if you submitted copies of documents, the adjudicator may want to see the originals to ensure that they are not fraudulent. USCIS sends a letter to each person they are going to interview with a list of documents you are required to bring to the interview. Even if documents are not listed, you should bring an accordion style folder and bring any and all original documents you think could be relevant. Here’s the reason why: If the adjudicator wants to see a document or original document and you didn’t bring it, they can issue a “Request for Evidence.” This can delay your case by several months. It’s better to bring documentation and not need it, rather than not bring documentation and need it. If you are preparing to go to an Immigration interview, just remember to relax, be prepared, and tell the truth. If you are concerned about anything they may ask you, or with something in your past that you are worried about, go talk to an immigration attorney. Anything you tell that attorney is protected by the attorney-client privilege. That means you and the attorney can talk about whatever it is, whether it is a problem, and how that problem can be solved.